Home Warranty for Your Swimming Pool. Is It Worth It? The Largest Pool Ownership and Warranties Research in the USA. 2019Updated. A pool is supposed to be a haven for stress-free relaxation. If your pool develops a major maintenance issue, however, it can quickly become a nightmare. Not only must you arrange for the repairs, you’ve got to shell out for an enormous, sudden bill. Such unexpected expenses can shatter your household budget and frustrate your plans. If you’re protected by a home warranty, the outcome could be different. If you have a good warranty on your side, the burden of paying for sudden, expensive repairs is lifted off of your shoulders. A small fee is usually all that’s asked to have the home warranty provider locate a repairman, arrange and schedule the service, and cover almost all of the cost. It’s not long before you’re back to enjoying the pool you’ve invested so much in. If you’re a pool owner, a good home warranty has the potential to make life much easier when things go wrong. But how do you find the good ones? The last thing you want is an inadequate or shoddy home warranty policy, especially for such a specific issue as pool repairs. How do you tell the difference? For most consumers, it’s nearly impossible to cut through the noise. When making the important decision of who to trust with your most valuable possession, your home, you need the best information possible. If you have a pool, you need to ensure it’s completely covered. That’s why we’ve put together this unbiased guide to pool coverage in home warranties. 2) If you intend to write about this study or incorporate data, statistics of charts we have created, do not forget to link back to this page as a token of appreciation for the hard work we put into it. We have created a here as well for your convenience. We analyzed information from a representative sample of 20 large companies to find out what the best coverage has, and what the worst doesn’t. We also considered a wide range of factors involved in pool ownership to help you consider what important expenses you might want to protect against. This guide won’t just give you the knowledge to invest in a new home warranty with pool coverage. It might even help you decide if your existing warranty, if you have one, is worth keeping. 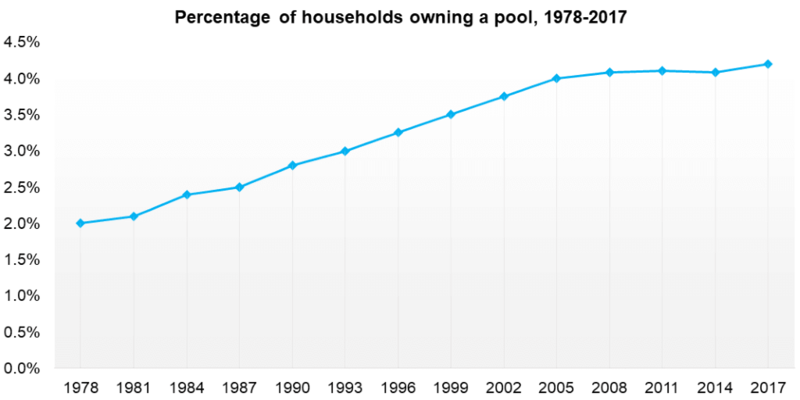 More U.S. homes have pools than ever before. Currently, 5.1 million homes, or over 4 percent of all U.S. households and over 6 percent of single family households who can potentially own a pool, have inground pools 1. In warmer states, the percentage can be far higher. For instance, in Coral Springs, Florida, an astonishing 66 percent of homes have inground pools 2. 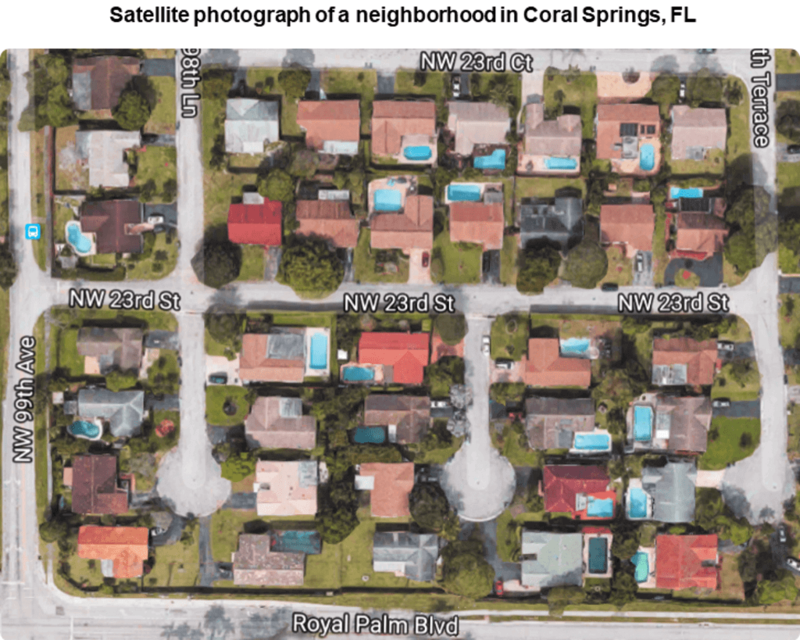 A satellite photograph of Coral Springs, above, shows neighborhoods bespeckled with the light blue of backyard pools. Not far behind is Scottsdale, Arizona, where 62 percent of homes have pools, and the figure is 46 percent in nearby Tempe, Arizona. Actually, of the top 10 cities for pools, Arizona hosts 6. Especially if you own or are planning to own a home in a warmer state, a pool is an increasingly common feature. The installation of new inground pools ranges from reasonably affordable to very expensive, depending upon the homeowner’s budget, preferences, and how much space they have to work with. The average cost of building a new inground pool depends upon on the type and method of installation. Self-installation can result in substantial cost savings, and may only cost between approximately $12,000 and $30,000 total 3, 4, with some estimates placing the figure as low as about $6,200 5. For many people, however, self-installation is not an option. Attempting, by themselves, to install a massive pool shell in a hole in their backyard just isn’t high on their priority list. That’s when they call for a professional installation, in which case the cost can rise substantially. We consulted a range of sources to determine an average of pool installation costs. Vinyl pools, the cheapest, range from $9,000 to $18,400. For fiberglass pools, a full professional installation ranges from an average of $12,900 to $39,200 6. By far, however, concrete pools are the most expensive. Almost without exception, these are professionally installed, and costs range from $25,900 to $54,300 7. The highest-end pools often cost much more than that. The author Earnest Hemingway famously installed a massive pool at his luxurious home in Key West, Florida 8. The only residential pool for 100 miles around when it was built, it was filled with fresh saltwater pumped from below the water table. At 60 feet long and 24 feet wide, it held 80,784 gallons of water. When it was built in 1938, it cost Hemingway $20,000. Adjusted for inflation, the same pool built today would cost over $344,000! Obviously, most pools are far simpler than Hemingway’s backyard oasis. Even still, every pool, whether self-installed or professionally installed, represents a major investment. Once the pool is installed, it must be maintained. 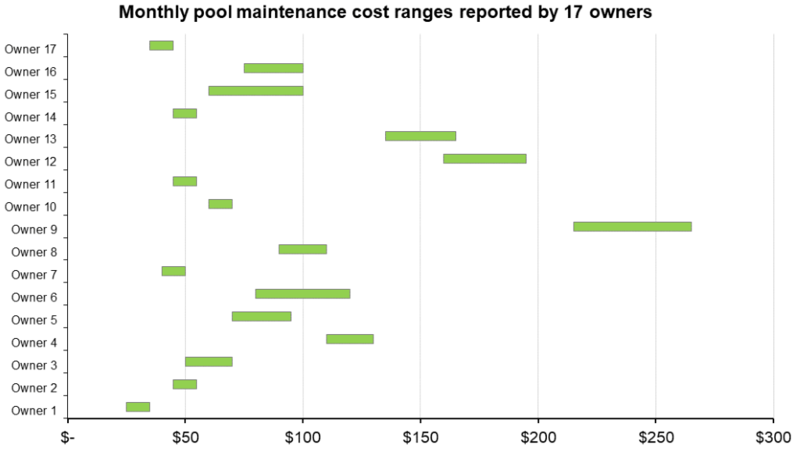 A self-reported survey of pool owners revealed various monthly costs associated with the maintenance of their inground pools 9. These homeowners reported maintenance costs ranging from a low of $30 per month to as high as $240 per month. On average, they spent between $85 and $95 per month on pool maintenance. Maintenance costs depend on many factors. For instance, a simple pool vacuum may cost as little as $20 for a basic version, or as much as $600 for a robotic model. If that or anything else breaks, having a professional out to maintain the equipment or do other cleaning services will cost, on average, $75 to $100 per hour. Other regular expenses include filters, which can range from about $12 to $75, maintaining pH levels, for which testing kits run $8 to $15, and chlorine, which can cost between $7 and $70. A pool cover will set you back about $600. Maintenance is not glamorous, but it’s essential for keeping a pool in top condition. As with changing the oil on an automobile, it’s part of the cost of ownership. Unfortunately, even proper maintenance cannot prevent major problems from occurring. The well-maintained car can still have expensive issues that arise, such as radiator or transmission failure. With pools, similarly, many things can go wrong. One of the most expensive problems that can arise is a leak in the pool itself. Many warm-weather states, where pools are more popular, have soil conditions conducive to shifting. This is why homes in these states often have foundation problems, and a pool is not immune to such issues. If a pool leaks, the minimum cost is $200 for a professional repair. Concrete pools must usually be completely drained and sanded down to be prepared, which adds an additional amount ranging from $800 to $1,550 10. Filter and pump systems can break down over time, and must be repaired. Depending upon the type, a filter replacement may cost from $150 to over $500, and a pump can cost between $185 for a smaller .75hp motor to $350 for a larger 2.5hp one. Many new pools are also equipped with heaters. Pools in cold-weather climates often have heaters installed so that homeowners can enjoy the pool year-round. These, too, are prone to breakage over time. The average cost for heater repair is about $400, but can easily climb to over $1,200 in some cases. While maintenance costs can add up, it is these major repair expenses that can most frustrate the experience of owning a pool. The total cost of pool ownership, then, is a combination of the regular maintenance of the pool and the breakage of major components that must be repaired. Inevitably, every pool owner who has their pool long enough will have to deal with, and pay for, both. In the long run, pool owners can expect to pay varying amounts for pool ownership depending on the type of pool they have, what accessories they’ve added, and the environmental factors their pool is exposed to. Generally speaking, fiberglass pools are the least expensive pools to maintain. However, there are still regular costs involved in ownership beyond potential repairs. This includes electricity usage and chemical usage 11. Vinyl pools, the least expensive kind, tend to cost more to own in the long run. The replacement of the liner becomes a factor, in addition to electricity and chemical costs. Vinyl liners only last 5 to 9 years, on average, and can cost $4,000 or more to replace. Concrete pools carry the greatest cost. Sanding and resurfacing the pool every 10 to 15 years can cost $10,000 or more. Every 3 to 6 years, a concrete pool requires an acid washing that can cost in excess of $500. Further, concrete pools still incur regular costs for chemical and electricity usage. These all drive the cost up substantially. Pool ownership can certainly be expensive, but when important components break, the cost can truly skyrocket. For this reason, and for general peace of mind, many pool owners may be interested to learn that home warranties often cover pools. As stated previously, however, choosing the right home warranty to cover a pool is a major task. Let’s turn, then, to considering what these policies actually cover, and what they don’t. After reviewing the data on pool ownership costs, many homeowners might be surprised to find out that a home warranty that covers pools is available. In fact, our survey shows that the vast majority offer it as an option. Of the 20 companies we randomly selected for this survey, 19 offer some sort of pool coverage. While it is an add-on in all cases, the costs are generally reasonable. Based on that sample, the average home warranty pool coverage costs between $100 and $205 per year 12. What they cover, however, is where the plans begin to show their differences. Some plans cover a great deal, while others cover very little. In fact, 4 of the 19 companies do not disclose any information about pool coverage on their website, except that they offer it. This is concerning, and could leave a homeowner in a very challenging situation when it comes time to make a claim. That leaves 15 of the 19 who provide details about coverage. The most important number to know is the coverage limit, which denotes how much can be covered for a given repair. This matters because, as previously mentioned, major repairs are the primary unexpected expenses that arise in pool ownership. Of those who provide coverage, the average coverage limit is $771. That is an average of 14 companies, because one company, as we will note, is an outlier and provides much higher coverage that would otherwise distort the average. Landmark Home Warranty $160.00 ? Total Protect Home Warranty ? ? Old Republic Home Protection $180.00 ? American Home Shield ? ? Anchor home warranty ? ? On the low end, 2 of the home warranty companies we surveyed have a coverage limit of $400, and another 6 have coverage limits of $500. If we group these together as the “below average” coverage limits for pools, a total of 8 companies fall into that category. Recall that one company offered much higher coverage. That company is Super, with a coverage limit of $10,000. As this is clearly above average, that means that there are a total of 4 companies offering above average coverage limits. Overall, our random survey of home warranty pool coverage costs yields some interesting results. 15 of 19 companies provided some detail about coverage limits, an important metric for any homeowner considering this as part of their home warranty. 8 of the 15 fell below average, 3 were average, and 4 were above average. Considering that major pool repairs often come in at close to $1,000, having an average to above average amount of coverage would seem preferable for most pool owners. This does not, however, guarantee that all issues will be covered. The most difficult part for pool owners investing in pool coverage for their home warranty is figuring out what’s actually covered. After all, if it doesn’t cover the most significant issues, such a policy won’t be of much help when an issue actually arises. On the whole, pool coverage generally tended to be more specific about what wasn’t covered than what was covered. We undertook an in-depth textual analysis of the warranty language for the companies we sampled to reveal what it told us about their coverage or lack thereof. On average, the policies spent an average of 37 words describing what was covered. They used almost twice as much space, 68 words on average, to detail what wasn’t covered. 3 of 19 companies didn’t disclose what they covered at all. The sections on what was covered from the 16 companies who provided them included several common elements, and were analyzed for the frequency of coverage for common items. Most often mentioned was the heater (covered by 13, or 81%), the filtration system (covered by 12, or 75%), the pump (covered by 11, or 69%), and above ground components (covered by 10, or 63%). Unfortunately, the data revealed that it is often far easier to make a list of items that home warranties don’t cover for pools. The most commonly mentioned items that were not covered included lights (mentioned by all 16 companies, 100%), jets (mentioned by 15, or 94%), liners (mentioned by 15, or 94%), and cleaning equipment (mentioned by 14, or 88%). Other items that generally were not covered included components such as solar water heaters, ornamental waterfalls and fountains, and fuel storage tanks. It’s important to note that not being included here does not mean an item is covered, but only that it wasn’t specifically mentioned. The rest simply don’t include it in coverage or use catch-all phrasing to describe a variety of items not covered. A general rule of thumb, which we recommend, is to only consider an item as covered if it is specifically mentioned as covered. Some special rules worth noting also showed up in the coverage. These could be make-or-break if they apply to you and you find yourself in need of repair. One such rule was that portable pools were not covered, generally. This was mentioned by 6 of the 16 companies, with 10 not mentioning it. Another was that coverage applied only to above ground items, mentioned by 10 of the 16 companies. If you have both a pool and hot tub (or spa), 10 of 16 companies say in their policies that they must share the same equipment or separate coverage must be purchased. 5, meanwhile, do not mention it at all, and 1 actually says the opposite, that they don’t have to share equipment. One final rule to keep an eye out for is the matter of special coverage limits. In addition to the overall coverage limits heretofore mentioned, some companies also impose special coverage limits on specific items. Our analysis revealed that 3 of 16 companies employed this tactic. Pool owners should be especially wary of such a tactic. Based on the grouping by coverage limits previously discussed, most pool owners would likely wish to opt for a warranty that at least rated as average, if not above average. Therefore, we first considered the most common expensive repairs and how the 7 average or above average companies compared. These four issues comprise many of the most expensive repair concerns facing the average pool owner. They are: filters, pumps, heaters, and pool vacuums (also known as pool sweeps). The only companies that cover all four of these major concerns were Home Warranty of America, Super, 2-10 Home Buyers Warranty, and First American Home Buyers Protection. It is worth noting that none of the companies cover pool leaks, based upon the data we gathered for this analysis. As the most expensive issue that can arise with pools, this is a very important matter for pool owners to consider. Further, none of the companies we sampled cover liner repairs and replacements, which that arises regularly for owners of vinyl pools. No study of pool coverage would be complete without an impartial look at some of the downsides mentioned by pool owners when they try to use their home warranties’ pool coverage. We surveyed reviews of home warranties from numerous sites. On the whole, pool related reviews comprised only between 2 and 6 percent of all home warranty-related reviews. The vast majority, 92 percent on average, were negative. This in and of itself is not surprising, as the home warranty industry receives mostly negative feedback online. Happy customers rarely go to the trouble to post reviews on such sites. That said, the content of those reviews can help to highlight the most common concerns. 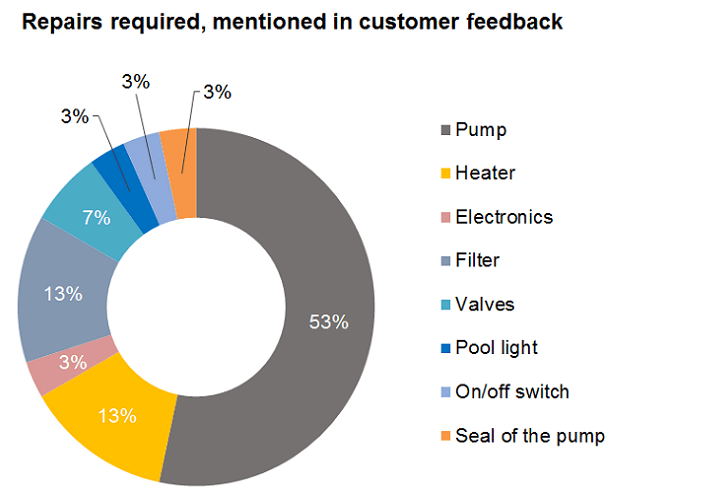 Of a total of 25 reviews sampled for this analysis, the most common repair issue cited was pump repair, with over half citing that as the reason for their claim. Every company in both our average and above average categories covers pump repair, meaning that they are less likely to have negative feedback registered. Heater, filter, and valve repair were also mentioned as common concerns. Of the 25 reviews, claim denial was the top concern cited, with 15 reviews offering negative feedback for that reason. Other issues mentioned included a delay in repairs with 5 mentions, tricky terms in the warranty with 5 mentions, and complaints about contractor professionalism with 4 mentions. 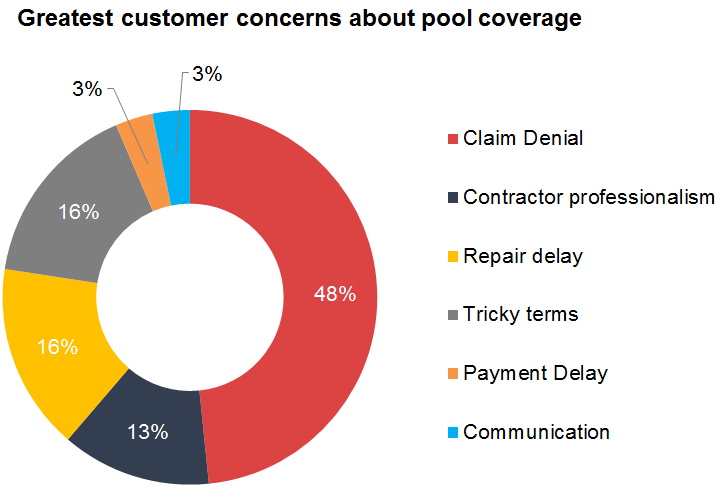 Interestingly, however, the companies we labeled as average to above average in their pool coverage were largely absent from the complaints. In fact, only 2 of 25 negative reviews mentioned those companies. Therefore, while pool coverage receives poor marks from consumers who give feedback, they mainly seem to be reviewing companies that provide lower coverage limits. We can thus conclude that higher coverage limits are correlated with fewer complaints, and greater overall customer satisfaction. A pool is a huge investment in a home, and an expensive one. The costs of pool ownership don’t stop at the installation, continuing for as many years as the homeowners wish to use and maintain their pool. Unexpected repairs, however, can frustrate the experience and cost a great deal. Home warranties frequently offer pool coverage as an option, and pool owners may want to know whether or not it is a good purchase. The answer depends, as with any insurance product, on risk tolerance and what is being protected. Vinyl pools, which have liners that wear out frequently, may not be good candidates for home warranty coverage. We did not find a single company that covered the very expensive process of repairing or replacing the liner in these pools. Fiberglass pools, on the other hand, would seem to be very good candidates for coverage because of their lower total cost of ownership. In these pools, the most common concerns will be items such as filters, pumps, and pool vacuums that can be covered by a home warranty. Concrete pools, owing to their much higher total cost of ownership and initial investment, may fall somewhere in between. No home warranty covers the expensive process of draining a concrete pool, for example. All pools, even vinyl pools, can benefit from home warranties if the homeowner is realistic about what will and won’t be covered. Filters and pumps were covered by all of the best policies. Pools with heaters and expensive pool vacuums would especially benefit from coverage, as these items are also generally covered by the best policies. Ultimately, the most substantial question pool owners must ask themselves is whether they’re willing and able to cover a major repair when it occurs. Even if the answer is yes, if they desire to ensure that the most common major repairs with their pool are taken care of with minimal cost and fuss, pool coverage just might make sense. In that case, they should find a company that’s worth using, and this analysis gives them the tools to do just that. 12 The home warranty companies we surveyed which provided some form of pool coverage are: CHW, SelectHW, THP, AFCHC, Landmark, AdHW, FAHBPC, TPHW, SecureHW, HSOA, AHG, ORHP, AHS, 2-10HB, FNHW, Super, HWA, IHW, and HMSHW.